If we were James Gunn, we would feel the pressure too. 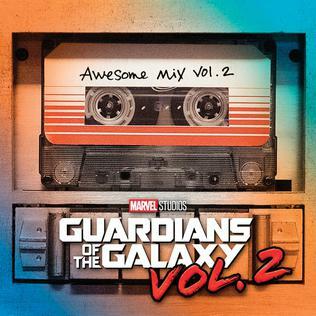 Guardians of the Galaxy: Awesome Mix Vol. 1, the awesome album to the Marvel Studios movie of the same name, reached number one on the US Billboard 200 chart, becoming the first soundtrack in history consisting entirely of previously released songs to top the chart. That’s some feat to beat. What can the music be more awesome in the sequel? We are proud to report that Star Lord’s second mixtape is a splendid compilation of songs you want to put on repeat. The 52 minute CD kicks off with English rock band Electric Light Orchestra's "Mr. Blue Sky”, an apt tune to set the mood for the superhero movie set in the cosmos. The space sound effects are nicely complemented by the orchestra arrangement, making it a perfect cue for the franchise. We continue to reminisce the good ol’ memories from the 1970s with American rock group Aliotta Haynes Jeremiah’s “Lake Shore Drive”, a tune thought to pay tribute to the psychedelic drug LSD (lysergic acid diethylamide). Don’t get high listening to the catchy song! British American rock band Fleetwood Mac’s “The Chain” is captivatingly nostalgic, while American singer songwriter Sam Cooke’s “Bring It On Home To Me” is an emotional and soulful tune to play on a melancholic weekend. Elsewhere, good feelings are aplenty country songs like Glen Campbell’s “Southern Nights” and Silver’s “Wham Bam Shang A Lang”. One track that may give you all the feels is English singer songwriter Cat Stevens’ “Father and Son”. If you have seen the movie, you’ll realise how this cue is played over one of the most poignant sequences ever filmed for a superhero movie. The soundtrack ends with “Guardians Inferno”, a song co written by Gunn and composer Tyler Bates. It features vocals from David Hasseloff, one of Star Lord’s childhood heroes. Listen carefully to the nonsensical hilarious lyrics!